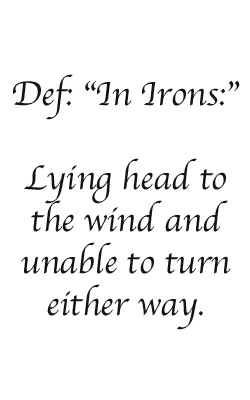 As you can see from the definition to the left, “in irons” is a position that all sailors work their best to avoid. In layman’s terms, being in “irons” essentially means “stuck," and even though the connotation is negative, there is a certain nautical and romantic irony that "in irons" is often where sailors end up—stuck to the call of the sea. If you’ve ever felt the gallop of a boat as it races across the water, or have hoisted the sails and harnessed the wind to move you across the sea, then you’ve felt the inescapable lure that sailing can have on the soul. 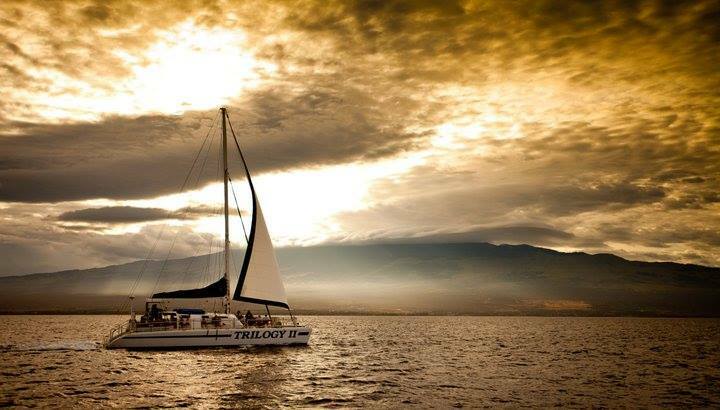 Here in Maui, many of our Captains working at Trilogy have been sailing for most of their lives. Whether they first started sailing as a four year old child like Captains Riley and Jim, or if they were raised in the mountains—like Captain Gabe—and sailed their way into adulthood, all continue to ride the sea of happiness that sailing can ultimately bring. To be sure, sailing in Maui plays a large part in our Captains' love for the sea. For one—it's warm, and with the exception of the coldest of winter days when the wind blows out of the north, the sailing in Maui is very comfortable and rarely calls for "foulies." The warm weather and temperatures aside, the sheer beauty of Maui's surroundings is best seen from the water. When sailing in the middle of the ‘Auau Channel between the islands of Maui and Lana‘i, the rugged ridgelines of Mauna Kahalawai stand naked against the sky. Over 1.5 million years of erosion have formed deep, shadow-lined valleys, which can regularly funnel 30 knot winds depending on the direction of the breeze. You can watch as clouds gather over Moloka‘i before sailing past the sea cliffs of Lana‘i, or raise a drifter for the evening sea breeze during a sunset sail off Lahaina. And while Haleakala is the "House of the Sun" and a popular spot for the sunrise, it's hard to beat the view of a sunrise while sailing to Molokini Crater. As Captain Riley stated in his interview in the video seen above, "we're literally sailing around the tips of the tallest volcanoes on Earth, in the middle of the Pacific Ocean, and you can't really get that perspective unless you're out there on the water." Aside from Maui's natural beauty, all of our Captains and crew agree there is something special about sharing this beauty with visitors from across the globe. Some people who join us are seasoned sailors and know their port from starboard, whereas other people are literally seeing the ocean for the very first time. Every day the stoke is re-kindled by being able to explain to someone how the wind is harnessed or how to trim a sail, or how every piece down to the fluttering telltales is helping to steer the boat. 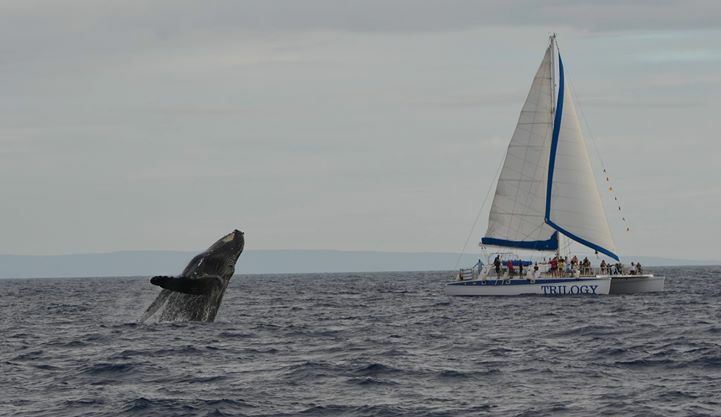 Another aspect of sailing in Maui is the degree of closeness with wildlife. There is something almost transcendental about viewing animals in the wild, and Maui's waters are a natural aquarium of enchanting and endangered marine species. It isn't uncommon for a pod of spinner dolphins to play in our wake while sailing, surfing the wave that is naturally created by the bow cruising through water. In winter, Maui's waters come alive with the splashes of thousands of humpback whales, and their powerful presence adds a degree of excitement to spending each day at sea. Finally, for many of the Captains in the Trilogy ohana, there is an element of family that goes along with spending each day on the water. Captains Jim and Randy who started Trilogy were born seafarers in Alaska, with their father having run a charter business out of the southeastern port of Ketchikan. Captain Casey was raised on these boats while his father, Captain Chris, spent 36 years and thousands of days sailing with Trilogy guests, and continues that legacy of family today with every day he sets sail. And even for the dozens of Captains over the years who have worn the Trilogy flags—many of whom have continued sailing in ports around the globe—there is the fraternal, shared, and salty bond of spending their days at sea. There is a deep sense of family and togetherness that is forged when a ship leaves port, and we consider ourselves fortunate to spend each day with the family and ocean that we love. 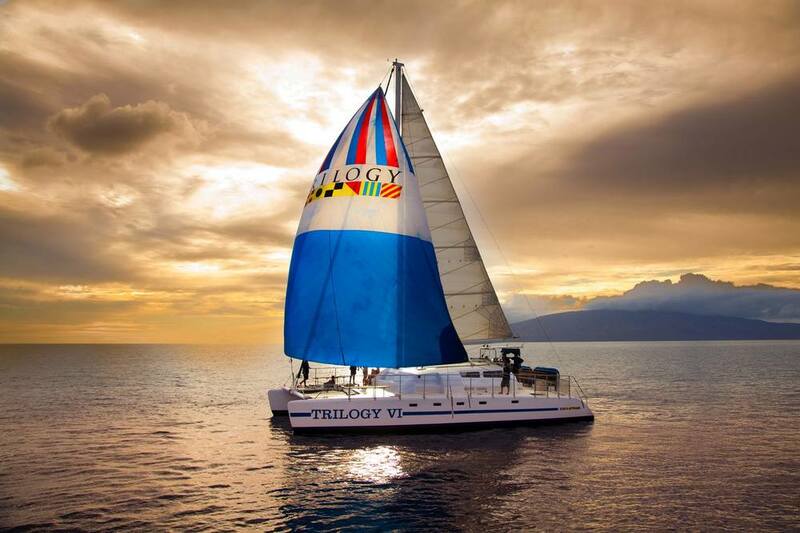 Have you ever spent a day sailing with Trilogy? Tell us a little about the experience in the comments section below!